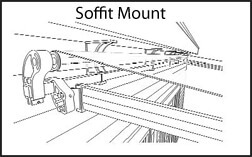 Width is defined as the measurement along the mounting surface you are considering. The other unit measurement is projection- the outward distance the unit extends away from the mounting surface when fully extended. Many homeowners chose to cover the entire width of their deck or patio. If this is your desire, take a measurement from the outside edge of the railing to the outside edge of the railing on the opposite side. This measurement will determine the overall unit width. The fabric of your awning will be 4 to 6 inches narrower than the overall unit which is why you included the railings in your measurement. 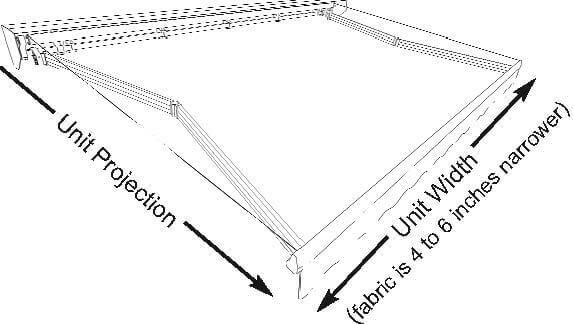 If your desire is to cover less than the full width of your deck or patio, add 6″ to your measurement for actual fabric coverage. 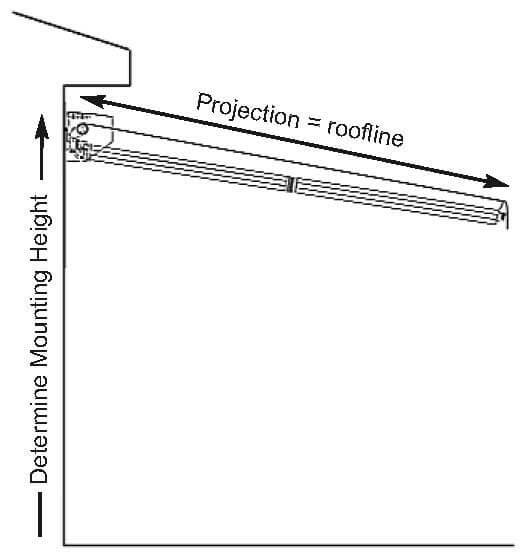 Things to consider: When you take this measurement, make sure there are no trees, poles or other obstructions that would interfere when the awning is extended. 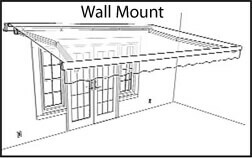 We offer three mounting options; please select the one that best achieves adequate mount height for the projection you selected – an important factor in the future performance of your awning. These are the minimum mounting heights, as measured straight up from your deck or patio surface. Typically used on flat two story homes where adequate mounting height can be achieved. Once you determine that this is the best mounting application for you, and identify the mount area, be sure there are no obstructions such as dryer vents, exterior lights or downspout in your way. For this mounting application you plan to install the unit directly to the underside of the eve or overhang of your home. To confirm this is a good mounting location, first check that there are no obstructions as described above. Next, open up the underside of your eve to confirm you will have some structural framework to mount the awning to. With this installation you will typically gain “virtual projection” of the unit as the unit will not be mounted against the wall you measured from. You typically pick up 4 to 6 inches of added protection. This is the typical mounting needed on ranch and bi-level homes to achieve adequate pitch. The brackets will mount up on the flat asphalt shingles, 2 rows back from the roof edge, over the eve. 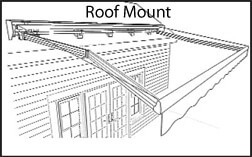 With the slope of the roof and the height of the brackets, add 12″ to the top edge of the roof to determine mounting height for this method. Specially designed roof mount brackets will need to be purchased for this installation. We offer two drive options, manual or motorized. The manual option is a 1:7 gear transmission installed within the unit that you operate by manually turning a crank handle. On our longest projection, you will have to turn the crank over 80 times. The gear transmission can be installed at the factory on either side of the unit, so consider which side would provide the most space to operate the crank handle. The beauty of the motorized drive option is that you just press a button once and walk away; the awning will fully extend or fully retract automatically. The motor can also be installed at the factory on either end of the awning. To help you select this drive option, determine the closest outdoor plug. All motorized units come with an 18’ long plug-in cord.